The Laney College Machine Technology Department is pleased to announce that $24,000 in scholarships will be awarded to Machine Technology students during the Fall 2015 and Spring 2016 semesters. 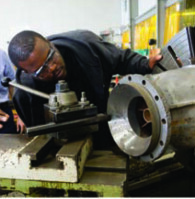 The announcement coincides with National Manufacturing Day, which takes place on October 2, 2015, and will be observed in the Bay Area and around the country through a variety of activities – 157 events are being held across California by companies and schools to highlight the careers and opportunities available in manufacturing. The scholarship funds for Laney College have been donated by the Gene Haas Foundation to help students pay for fees, books, tooling and other expenses necessary to complete their Machine Technology and Industrial Maintenance Certificates and Degrees. This is the third year of donations for student scholarships by the Gene Haas Foundation. The scholarship funds are administered through the Machine Technology Department and the Peralta Colleges Foundation. “We are proud of our Machine Technology leadership team, especially Chair Louis Quindlen, for consistently ensuring that our students and their success remain our central focus,” said Dr. Elnora Webb, President of Laney College. “Because of them, we have invaluable partners who consistently invest in the effectiveness of the program in order to prepare even more students to enter the workforce and help us lead in the areas of industrial and advanced manufacturing,” added Dr. Webb. National Manufacturing Day addresses common misperceptions about manufacturing by giving manufacturers an opportunity to open their doors and show, in a coordinated effort, what manufacturing is — and what it isn’t. By working together during and after MFG DAY, manufacturers will begin to address the skilled labor shortage they face, connect with future generations, take charge of the public image of manufacturing and ensure the ongoing prosperity of the whole industry. Supported by a group of industry sponsors and co-producers, MFG DAY is designed to amplify the voice of individual manufacturers and coordinate a collective chorus of manufacturers with common concerns and challenges. The rallying point for a growing mass movement, MFG DAY empowers manufacturers to come together to address their collective challenges, so they can help their communities and future generations thrive. The Laney College Machine Technology Department is proud to be a part of this effort.